A Connecticut man charged with killing his 7-month-old baby by throwing him off a bridge testified Thursday that he dropped the boy and did not intend to harm him. 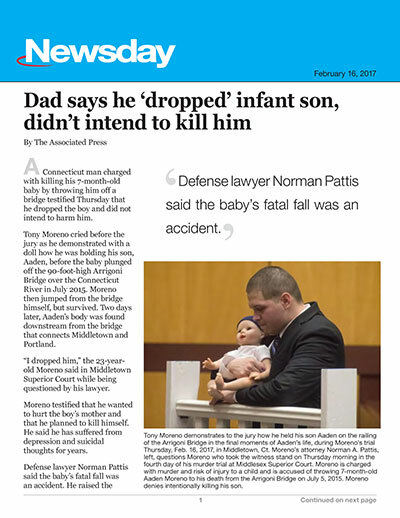 Tony Moreno cried before the jury as he demonstrated with a doll how he was holding his son, Aaden, before the baby plunged off the 90-foot-high Arrigoni Bridge over the Connecticut River in July 2015. Moreno then jumped from the bridge himself, but survived. Two days later, Aaden's body was found downstream from the bridge that connects Middletown and Portland. "I dropped him," the 23-year-old Moreno said in Middletown Superior Court while being questioned by his lawyer. Moreno testified that he wanted to hurt the boy's mother and that he planned to kill himself. He said he has suffered from depression and suicidal thoughts for years. Defense lawyer Norman Pattis said the baby's fatal fall was an accident. He raised the possibility that Aaden may have had a muscle disorder that caused sudden, jerking motions, possibly explaining how Moreno dropped the child. Moreno has pleaded not guilty to murder and risk of injury to a minor. The boy's mother, Adrianne Oyola, 20, testified Wednesday that her relationship with Moreno took a turn when she refused his marriage proposal in June 2015. The two worked out a custody agreement for Aaden, and it was Moreno's turn with his son the day Moreno had the child at the bridge. Just days before, a judge denied a permanent restraining order against Moreno, after Oyola accused him of threatening and pushing her. A temporary restraining order had previously been in place. "Where are you!" Oyola texted shortly before midnight. "Where's Aaden?" "He's dead," Moreno replied. "Soon I will be too." "You couldn't kill your own son!" Oyola texted. Her final texts included, "Please don't hurt Aaden!!!" and "Please!!!!!!!!!" Moreno testified that Aaden was still alive when he was texting with Oyola.